Varadkar was shocked to learn his "true age" was 53. 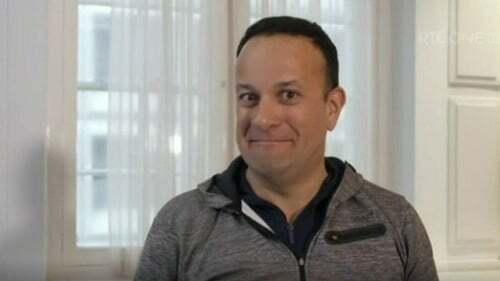 When Leo Varadkar - the 40-year-old triathalon-loving, early-rising, former minister for health and sport - learned that his "true age" was 53, no one was as surprised as he was. In fact, he was downright horrified. The Taoiseach was one of several high-profile personalities who had their metabolic ages calculated, including Aengus Mac Grianna, Anna Geary and Bláthnaid Treacy during an episode of Operation Transformation earlier this year. And now, he wants another go. Under the watchful eye of Operation Transformation's own fitness expert Karl Henry, the Taoiseach will have his fitness rigorously tested using a different regime to the now-infamous one he questioned. Speaking to RTÉ Lifestyle, Henry explained how this new test went: "We did six tests, all in all, two measurements based and four physical fitness tests and we will be reassessing the same tests in six weeks' time and doing another episode around it. "He’s in great shape and I’m looking forward to seeing his progress in six weeks' time." This new test will include a sit-up test, press-up test, plank test, and a one-kilometre run test, and will be carried out for Henry's podcast, Real Health, airing this Thursday. After that, Varadkar will be set a challenge to improve upon his results for the next six weeks. After the first fitness test, the Taoiseach will do an interview with Henry, discussing how he approaches his own health. Metabolic weight is measured according to age, weight, height, activity level, body fat mass, and lean body mass and monitored when the body is in as neutral a state as possible, so usually after 12 hours of fasting. As muscle burns more fat, the rule of thumb is that the fitter you are, the lower your metabolic age. Henry said "I am fascinated how he stays healthy, it’s an incredibly busy and stressful job and our listeners have so much to gain by getting an insight into his health and fitness. "As we approach our 1 millionth listener in less than 12 months, I always strive to have guests who really interest our listeners and who more fascinating than the leader of the country." After the Taoiseach's results were announced, many were left scratching their heads over how someone as fit and conscientious about his health could have so high a metabolic age. Fingers were pointed at environmental factors such as stress and the adverse effects of a high-pressure lifestyle on an otherwise healthy person, as well as whether or not the Taoiseach is carrying more weight than he realises. Read more about where Leo went wrong the first time around here. Speaking to Independent.ie, Henry said: "In terms of An Taoiseach I'm intrigued by how does he de-stress at night, what does he eat, and how does he fit in exercise with all the travel that he does?" While Henry says the public will be "impressed" by Varadkar's results, the Taoiseach has also challenged two of staff at his department to take on the six-week challenge as well.